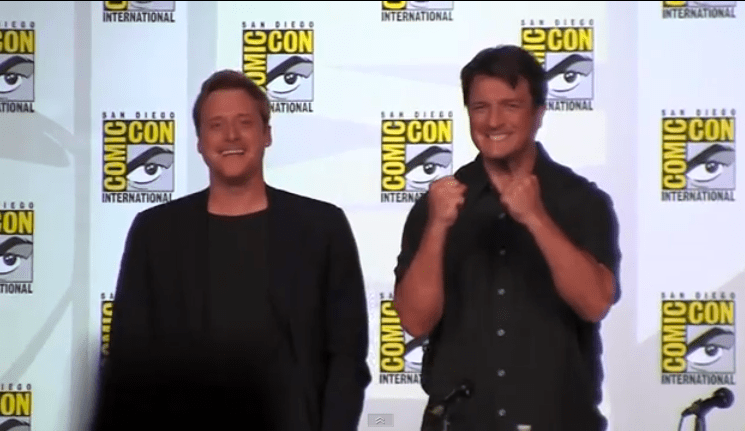 Alan Tudyk and Nathan Fillion cheering the crowd as the crowd cheers them. Image source: YouTube screen shot. San Diego Comic-Con was a blur of awesome, as usual. Now that it’s over, I’m glad to sit back, rest my weary feet, and enjoy what was arguably the most awesome event of all: the Firefly reunion panel. I missed it in real life: couldn’t devote a whole day to standing in the thousands-deep line for Hall H. Hooray for YouTube. I made it about forty-five seconds into this video (“He wanted to be introduced as a bounty hunter and sandwich maker, but you know him best as a leaf on the wind”) before I teared up. How about you? See 47:33 for a truly heartwarming moment: Joss Whedon (and much of the cast) getting choked up at the question, “What do the fans mean to you?” Nathan Fillion leads the panel in a standing ovation of the audience — a poignant tribute to the devotion of the fans, and a testament to the reciprocity of the relationship between Firefly ‘s creators and its deeply loyal viewers.